Z-average cumulant size or peak size in DLS Which is better? FAQ: Peak size or z-average size – which one to pick in DLS? What are the key differences between these two algorithms? The z-average is determined according to an ISO method [ ISO13321:1996 or its newer pendant ISO22412:2008 ] where only the initial part of the correlation function (up to 10% of the intercept) is force fit to a single exponential decay. The decay rate is related to the overall mean size. The next order fitting term is related to the polydispersity of a Gaussian size distribution if one assumes that as the underlying particle distribution. For the distribution analysis (regularization techniques such as non negative least squares NNLS, or CONTIN) the correlation function is fit to longer times (i.e. more of the data are fit, typically to 1% of the intercept). The outcome is a distribution of different contributions from the size classes or bins, and peaks can be defined with a statistical mean and standard deviation of that specific peak. Why aren’t the two the same numbers, trending the same way? 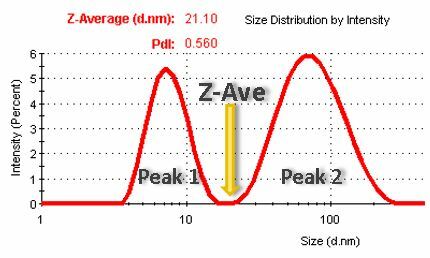 For a perfectly monodisperse sample, the two results should be the same, that is the z-average should be the same as the mean of the (one and only) peak in the distribution. In real applications, even for monodisperse samples, this is likely not the case and there will be small differences. For polydisperse samples, the two can not be the same, because the z-average will still be only a single number, whereas the distribution will show two or more peaks with corresponding mean and width. z-average smaller than peak size: The cumulant fit only is to the initial part of the correlation function, so in a way, slightly overemphasizes the initial decay from the smaller part of the distribution. 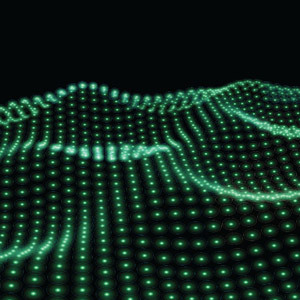 If there is an additional peak at small size due to additives or buffer components (sometimes called a “solvent peak”) this could be the cause for the average size lower than the expected peak size. 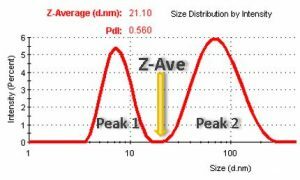 z-average the same as peak size: Ideal, probably monodisperse sample. In very odd situations it could be a very polydisperse sample where one of the peaks happens to match the overall average size. Fortunately the quality report in the Zetasizer DTS software checks for these occurances and will point towards the correct interpretation of the encountered result. In distributions a further choice in the interpretation is discussed in an earlier blog post about intensity-volume-number distributions. 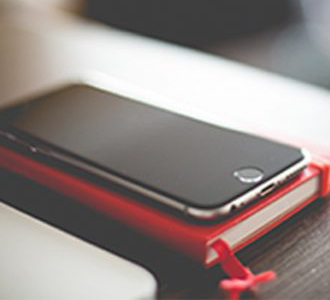 Technical Note: Intensity – Volume – Number: Which Size is Correct? FAQ: What is the z-average? Post: Polydispersity what does it mean?